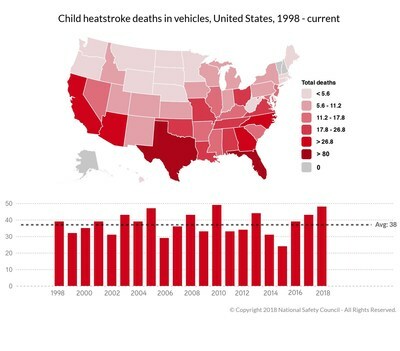 ITASCA, Ill., April 10, 2019 /PRNewswire/ -- Tragically, more children died in hot cars in the United States in 2018 than any other year on record, the National Safety Council confirmed today. Fifty-one children died last year of pediatric vehicular heatstroke, topping the single-year high of 49 set in 2010. In response, the Council is releasing a free online training "Children in Hot Cars" that provides vital information about pediatric vehicular heatstroke and outlines how distraction and other behaviors can lead to these unnecessary deaths. The Council is issuing the training during Distracted Driving Awareness Month, observed each April to educate about the various forms of distraction behind the wheel. Sadly, many drivers forget their children in the back seat because they are distracted, making hot car deaths one distracted driving consequence that often is overlooked. "Last year, we set one of the saddest records in U.S. roadway safety history," said Nick Smith, interim president and CEO of the Council. "We believe this new training will go a long way toward educating people about pediatric vehicular heatstroke and empowering them with tips so they can avoid behaviors that can lead to these tragic deaths." The "Children in Hot Cars" e-learning course provides information about why cars heat up so quickly, why children in particular can succumb to increasing temperatures in cars, and what parents, caregivers and others can do to prevent these needless deaths. The course is interactive, free and can be completed in 15 minutes or less. It is the most recent pediatric heatstroke resource developed by the Council, which published Kids in Hot Cars: A Legislative Look Across the U.S.last summer. In the course, parents and caregivers are advised to stick to a routine to reduce the risk of forgetting a child in a vehicle. Other tips include keeping car doors locked so children cannot gain access, and teaching them that cars are not play areas. Placing a purse, briefcase or even a left shoe in the backseat of a vehicle can force drivers to look before they lock. On average, 38 children under the age of 15 die each year from heatstroke after being left in a vehicle or gaining access to an unlocked vehicle. Since 1998, all but three states – Alaska, New Hampshire and Vermont – have experienced at least one death of a child in a hot car. Deaths have occurred in every calendar month, including all winter months. To access the "Children in Hot Cars" e-learning course, visit nsc.org/hotcars. For more information about pediatric vehicular heatstroke, visit noheatstroke.org.